As regards the new compositions, I should like … to recommend the big dramatic overture ‘The Hussite’ and the Scherzo capriccioso, both for large orchestra. I presented both works last year at St. James's Hall and the Crystal Palace in London and now I am writing for the Philharmonic Society in London a new symphony which I must conduct myself on April 22nd of this year. This mutual love affair was consummated when, after returning home in June 1884, he was elected as an honorary member of the Philharmonic Society and commissioned by it to write a symphony. Dvořák was in no small way impressed by this honour (commissions from the society had resulted in Beethoven’s Ninth Symphony and Mendelssohn’s Fourth earlier in the century) and in December that year he set to work on his Seventh Symphony. By the end of the month he could write to a friend, ‘wherever I go I think of nothing but my [symphony], which must be capable of stirring the world, and may God grant that it will!’ At the beginning of 1884, Dvořák had travelled especially to Berlin to hear an early performance of Brahms’s Third Symphony and it had made a deep impression on him. Brahms had also cajoled the younger composer somewhat about writing a better symphony than his previous effort and Dvořák was keen to prove himself. 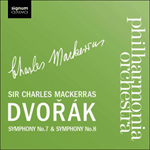 This was not quite the normal rivalry between composers, since Brahms had been instrumental in lending Dvořák not only encouragement and support, but also, after hearing his 10 Moravian Duets in 1877, personally recommended Dvořák to his own publisher, Simrock. Their relationship was one of mutual respect, though it is clear that Dvořák was in awe of Brahms, even submitting the proofs of many a work to the German. Having already scored a great critical and financial success with Brahms’s own Hungarian Dances, Simrock was keen to repeat the experience, and did so by publishing Dvořák’s Slavonic Dances and achieving an extraordinary over-night sensation. Dvořák was keen not to let Brahms down, and admitted as much to Simrock in a letter of February, 1885. A month later, the symphony was complete and a further month on he was conducting the first performance of the work on 22 April at St James’s Hall, London. Writing to his friend Antonin Rus of the occasion, Dvořák enthused, ‘This time, too, the English again welcomed me as heartily and as demonstratively as always heretofore. The Symphony was immensely successful and at the next performance will be a still greater success’. Despite having being written in a matter of three months, the symphony displays a formal mastery which is matched only by an emotional intensity, infusing what might be called the ‘international’ idiom of the day with tightly controlled and developed Slavonic musical elements and colourings which are tinged more with storm and melancholy than with joy.